The announcement this summer that Cummins was voluntarily recalling 500,000 engines because of a defective emissions control component was a reminder that manufacturers still face technical challenges as they comply with emission-reduction mandates. Meanwhile, fleets continue to encounter their own challenges dealing with aftertreatment technologies that are now being refined after major changes in years past. From a maintenance perspective, aftertreatment systems are improving, said ­Cindy Crawford, Ryder group director of field maintenance at Ryder System Inc.
“They’re really designing defects out and they’re focusing on elongating the maintenance intervals as well, and I think as with any processes, as they increase their production runs, we’re finding that they get better at manufacturing better quality engines as well,” she said. Engine manufacturers have been installing new aftertreatment systems and technologies in response to a series of federal clean air mandates adopted by the U.S. Environmental Protection Agency starting in 1997 to reduce emissions of nitrogen oxide (NOx), particulate matters and nonmethane hydrocarbons. These systems reduce emissions by treating exhaust gases after combustion but before they are released through the tailpipe. Standards that began taking effect in model year 2004 led to manufacturers installing exhaust gas recirculation (EGR) technology to reduce emissions of NOx. Later standards led to the introduction of the diesel particulate filter (DPF) in 2007 and selective catalytic reduction (SCR) in 2010. Scott Barraclough, technology product manager for Mack Trucks, doesn’t expect major changes soon, including for manufacturers to comply with the upcoming 2021 greenhouse gas emissions update. Since 2010, the industry has been largely in a refinement and improvement mode. “For the foreseeable future, you are going to continue to have a DPF and SCR on your vehicles as well as the EGR as far as aftertreatment goes,” he said. Doug Kading, vice president of maintenance with Salt Lake City-based C.R. England, which has about 4,000 units, said the addition of SCR in 2010 was particularly challenging. Added to the 2007 addition of DPFs, it made after­treatment the No. 2 cost item behind tires for the fleets that C.R. England benchmarks against. After 2010, there were just too many unknowns, too many new technologies to master and too many issues with sensors. The systems were especially intolerant of upstream fluid leaks. “And it was fairly common to wipe out the entire system, which, depending on manufacturer, could be over $15,000 really quick down the drain,” he said, noting he didn’t think anyone was prepared for the amount of downtime and the number of failures early on. However, it’s “improved significantly,” Kading said. C.R. England ranks No. 25 on the Transport Topics Top 100 list of the largest for-hire carriers in North America. John Moore, product marketing manager for powertrain at Volvo Trucks North America, said the systems are becoming more efficient, the filters and sensors are better and the software is improving. They require fewer parked regenerations, in which the driver must park the truck and manually begin the process of cleaning the DPF. He said systems will become smaller and more efficient. The refinements, though, can be challenging on their own. On July 31, the EPA announced that engine maker Cummins was volun­tarily recalling 500,000 model year 2000-2015 heavy- and medium-duty trucks because a defective part in the SCR system degraded too quickly, allowing excessive nitrogen oxide emissions. “The issue is not a safety issue, but Cummins recommends that customers get the hardware replaced to ensure their vehicles continue to meet emissions expectations,” Jon Mills, director of external communications at Cummins, said in a statement. Mack’s Barraclough said the last major change was the easiest. With EGR in 2004 and DPFs in 2007, the domestic market was the first to adopt the technology. However, with the 2010 update, SCR had already been in use elsewhere in Europe and Australia. Volvo’s Moore said the early challenges involved ensuring the system was robust and would rise to the temperatures needed to incinerate the soot off the filter, and that the pro­cesses would be safe and intuitive for drivers. Among the designers’ fears was that a driver would try to regenerate near combustible material, such as a tree. “When you’ve got 1,100 degree Fahrenheit exhaust temperatures coming out of an exhaust pipe right on a dry combustible material, it can cause problems real quick,” Moore said. Ryder, which has a fleet of nearly 241,000 vehicles, has dealt with the changes in several ways, including being more proactive and pre­ventive. It’s created a team of certified aftertreatment technicians, or a CAT team, positioned throughout its network to troubleshoot problems and mentor other technicians. The company has tried to be more proactive in educating customers and drivers about the systems. A reliability engineering team is analyzing data in consultation with a cross-functional maintenance team. “We have to be surgical in our approach to solving issues, and so we use data in our team of maintenance experts to really combine that data analytics with that expertise,” Crawford said. Meanwhile, upstream fluid leaks remain a concern. The 2017 greenhouse gas-compliant engines “are much more robust” than the 2014s, Kading said. Nevertheless, the fleet does have issues with aftertreatment systems. It still has about the same number of failures with NOx sensors and differential pressure sensors, he said. The doser that squirts fuel into the aftertreatment system can cause a problem, and a fleet must stay current on software updates. The most recently purchased vehicles have maintenance intervals of up to 500,000 to 600,000 miles versus 200,000 to 300,000 miles in earlier models, Kading said. Years ago, C.R. England began servicing significantly earlier than the manufacturers’ suggested intervals, and it has continued to do so, he said. It does cost the company to service its trucks more often, but it has also reduced failures and check engine lights. And that’s worth it, Kading said. One truck parked on the side of the highway can be expensive. A remanufactured filter in stock can cost $1,500 to $2,000, and a new one can cost $3,000. California, however, does not allow remanufactured filters. Paul Pettit, vice president of maintenance at P.A.M. Transport, said aftertreatment systems remain one of his fleet’s highest maintenance costs, and they still can be a major headache for fleets. Cleanings of DPFs now are more thorough, Pettit said. In the past, a cleaning might be 70% effective. 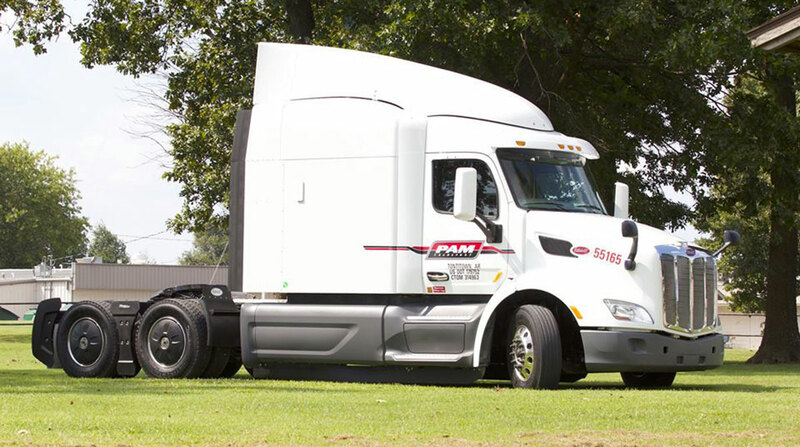 P.A.M. Transport ranks No. 71 on TT’s Top 100 list of for-hire carriers. As for more insights into finding and preventing leaks associated with aftertreatment systems, Mark Hawkins, technical specialist with Redline Detection, said a simple leak can cause a temperature issue that will degrade the system’s ability to function properly. It might increase fuel consumption, or it might cause the DPF to prematurely plug. Leaks can cause regeneration processes to happen too frequently or not enough. Redline Detection’s products use high-pressure smoke to find leaks, Hawkins said. A field test by the company found that 83 of 100 vehicles had leaks serious enough to lower fuel economy or degrade DPF performance. However, in 73% of leaks, the problem is simple — a clamp, a gasket or a cracked exhaust pipe. However, he said technicians often assume a more expensive part is the problem, increasing maintenance costs unnecessarily. Meanwhile, in recent years, manufacturers have moved to a configuration that combines the DPF and SCR in one container. Volvo’s Moore said the soot burns off the filter better in its one-box exhaust aftertreatment system because it is sealed and insulated. It also reduces the number of regenerations. Ryder’s Crawford said those types of systems are more costly but less maintenance intensive. Generally, if something goes down, the entire system has to be replaced. But her company hasn’t replaced many. Likewise, C.R. England’s Kading said there is no downside to the technology. “It’s great — saves weight, increases the service interval,” he said. Manufacturers are making other refinements to the technology. Brian Daniels, powertrain and component product marketing manager for Detroit, said an auto-elevate feature temporarily increases exhaust temperatures by increasing rpm while idling, eliminating hydrocarbon buildup. The company uses a proprietary liquid cleaning service that removes more than 95% of the ash, which he said is an improvement over air-only systems. Detroit is part of Daimler Trucks North America. In early August, Cummins announced that it had integrated its turbocharger and aftertreatment system into a single system. Its integrated rotary turbine control system allows exhaust gases to be 70 degrees Celsius hotter when they reach the SCR than in traditional aftertreatment systems, the company said. Looking ahead, manufacturers and fleets will continue to respond to changes in the marketplace and the regulatory environment. Among other engine manufacturers, attempts to speak with Paccar and Navistar were not successful.